CRESCENT FOODS Frequently Asked Questions. You asked, we delivered! Here at Crescent Foods, we are working with various farmers to meet your demands and satisfy those chicken cravings. We continue have the same natural and quality attributes from the very start and therefore committed to providing you with products through the utmost trust, integrity and quality. Our products are hand harvested, humanely raised, vegetarian fed with no animal by-products, free of antibiotics and hormones, and are raised cage free. Are all Crescent Foods products free of antibiotics? Due to more than one supplier, our chicken may vary in size. Why is this so? Like us, birds come in various shapes and sizes. The size of the bird is contingent upon the number of days the bird has been on the farm which can range from anywhere between 42 to 58 days. It is our ethical responsibility to provide the utmost care for our animals. All chicken houses consist of controlled, cage-less areas that provide adequate space, fresh air, and clean water that is readily available for all our chickens. We are dedicated in providing our chickens with an all-natural feed and ensuring they are raised in a safe and comfortable environment. Are our products always deboned by hand? By carefully hand-deboning fresh chicken products, we can ensure superior quality consistently across all our offerings. This manual process allows us to control the cuts of meat and improves the overall quality of bone removal in comparison to mechanical methods. How do I know it is really Halal? 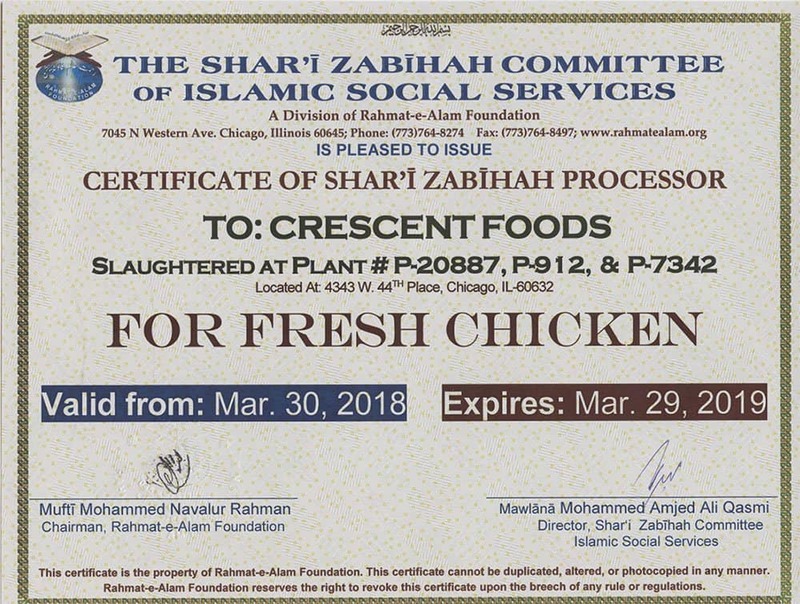 On a frequent and regular basis, the Shar’i Zabihah Committee of Islamic Social Services conduct random inspection visits to Crescent Foods’ Slaughtering and Processing facilities to determine Halal compliance. They renew this certificate only after a thorough, certified inspection is complete. All Crescent products are certified to be pure Halal by the highest national standards set in North America and around the world. This means the birds are raised on all-vegetarian feed, they are treated and processed in the most humane of ways, and are free of preservatives, artificial ingredients, hormones, antibiotics and color additives. Halal is an Arabic word that means permissible. 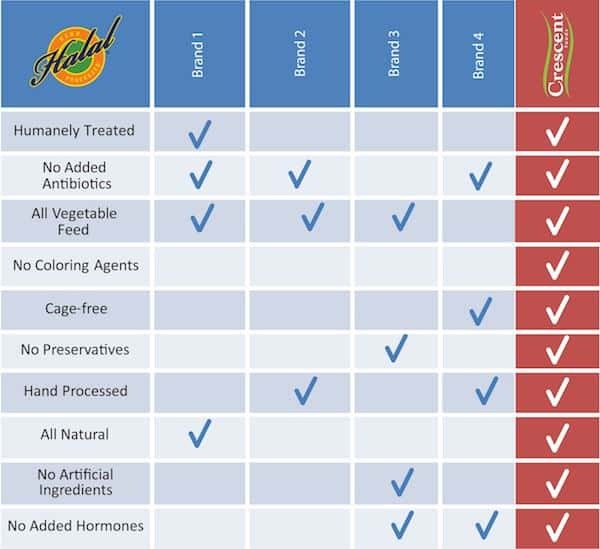 Halal products are healthy, offering natural goodness for you and your family. Halal protein products should be made from humanely treated animals that are raised and processed in a gentle environment and clean conditions. If you are concerned about the highest standards from Farm to Fork, be sure to look for Crescent Foods’ Halal symbol on the package. What’s the safest way to handle poultry? Crescent Foods practices safety procedures over and above that which is required by the U.S. government. Make the grocery store your last stop before returning home. Select fresh chicken just before checking out. 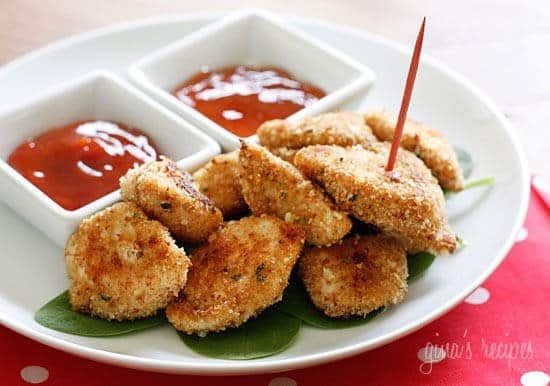 At home, refrigerate the chicken immediately and use it within two days. Or freeze it. Always wash hands, countertops, cutting boards, knives and other utensils with hot soapy water before they come in contact with other raw or cooked foods. Do not use the raw chicken marinade as a sauce poured over cooked chicken. To check visually if the chicken is done, pierce chicken with a fork. Juices should run clear – not pink – when fork is inserted with ease. If you’re transporting cooked chicken, put it in an insulated container or ice chest until ready to eat. Keep below 40°F or above 140°F. Do you have any tips for handling your chicken? Choose all your fresh meat last when you are grocery shopping. That way it will stay cool until you get home. Never leave chicken in a hot car or on your counter top warming up to room temperature. Keep it in in the coldest part of your fridge. We recommend you use it within two days. If you don’t, then freeze it. Thaw it in the fridge or place it in a plastic bag and submerge in cold water. Change the water often. Before you prepare it, be sure to wash your hands, cutting board, and utensils. Be sure to cook all poultry to an internal temperature of 165 degrees F. The juices should run clear, not pink. Don’t leave leftovers at room temperature longer than 2 hours. Either keep them hot, or refrigerate them. Cooked chicken is best refrigerated no longer than 2 days. If you reheat it, cover it to retain moisture. Does Crescent Chicken Cook like Regular Chicken? Crescent chicken has less fat. Depending on your cooking method, you may want to keep the chicken covered in order to keep it moist, or add a bit more of your marinade. Remove the cover toward the end in order to brown. Crescent chickens taste better than other chickens you may have had because they do not need to be masked with heavy sauces or coatings. Lighter marinades do the job just fine. Aren’t there Enough Chicken Choices Already? The National Chicken Council forecasts the American per capita consumption of chicken at over eighty pounds a year. Wouldn’t it be a good idea if that eighty pounds was as good… and as good for you… as it can be? That’s why you need Halal chicken from Crescent Foods. What do you mean, your chicken has better fiber? Did you know that most commercial chickens are raised in overcrowded chicken houses. The opposite end of the spectrum is “free range” where chickens are given access to the outdoors. Our birds are raised in flocks, in roomy barns with plenty of sun and fresh air. Because they can move freely, they develop muscle with superior fiber. That results in superior flavor. Unlike many free range birds, we can control what our birds eat. So we know they only get rich, nutritious grains: a 100% healthy vegetarian diet. Everything we do for our birds results in healthier, cleaner meals for customers and family. Why should I pay a premium for Crescent? It’s simply a fact that it costs more to raise chickens the way we do and to process them quickly, humanely, free from any kind of additive whatsoever. But the time and care we take results in finer flavor, less fat and better fiber. You could pay less for chicken that includes artificial ingredients, injected oils and fats, coloring agents and added water and flavorings. Can you think of a reason your customers or your family should be eating those? Neither can we! Most of you will never have tasted chicken this fresh, clean and nutritious before. One pound of raw chicken with bones yields 1 cup cooked, boned meat. Chicken thighs are slightly higher in fat, but are more flavorful and juicy. To prevent chicken skin from bubbling, poke fork holes in it before grilling. If you start grilling with the bone side down, you are less likely to burn the bird. Marinate chicken in the fridge, not at room temperature. Discard the liquid that you use to simmer the bird and replace it with a low-fat sauce. Grilling allows fat to drip away. When oven roasting, don’t let the bird sit in the drippings; use a grid or rack in the pan. You can thicken gravy or stew with pureed cooked vegetables instead of fat and flour. Use yogurt instead of mayo in chicken salad. Cook more chicken than you need. Use the leftovers in low fat sandwiches for the kid’s lunches. Frying chicken? Refrigerate the coated parts, uncovered, for up to an hour before frying. The coating will stick better. Add a little bran or wheat germ to your coating mixture; it adds fiber as well as texture. For storing in the freezer for longer periods, wrap ground beef securely in heavy duty plastic wrap or foil. Assuming your freezer is at 0°F, ground beef stored this way should be fine for a couple of months. Make sure you mark the packages with the date you froze them so you don't forget how long they've been in there. Grass-fed beef cooks faster – so cook it for less time. Grass-fed beef cooks a little faster than ordinary beef, and also shrinks less, because it's leaner. Seasonings, sauces, and sides will likely add more flavor to grass-fed beef dishes, because your taste buds don't get coated with beef fat. This indicates that no antibiotics were used on the animal in its lifetime. Antibiotics are used to prevent and treat disease in animals – just like in humans. If an animal does have to be treated with an antibiotic for illness, our meat cannot be sold in a naturally raised system and cannot have a label with the wording "antibiotic free".